…So what do we do? Clearly, the web these days – and in particular, music on the web – is ALL about sharing. Without sharing, we’re all screwed. Enter Posterous – it’s a blogging platform that’s been around for a while, but seems to be really gaining in traction of late for a whole host of reasons. I’m going to focus on what an awesome service it is for embedding, and posting links to, things you really like online. “but, isn’t that what Twitter’s for?” you say. Well, yes, but Twitter’s so much more than that – by that token, I’d stop talking to people cos Twitter’s about conversation as well, and stop reading the news, because Twitter tells me about it. No, the cool thing about Twitter is that everything’s bigger than Twitter – it’s a distribution mechanism, not a closed ecosystem. So Posterous – amongst all kinds of other possible uses – is where you can collect together all the things that you dig. A great place to tell the world about the music your talented friends are making. About proper awesome things you find on YouTube, with links to find out more. It’s a bigger deal than updating your Facebook status, and helps to keep it all in one place, as social DNA, and will act as an excellent gateway drug to the world of blogging, sharing, and building that social DNA into something coherent. Because, of course, if people like the things you link to, they are far more likely to be interested in the art that you yourself make. Infintely more likely to. So, how do you start your Posterous blog? well, that’s the truly awesomely amazing bit about it – just send an email to post@posterous.com. That’s it. Email your first post to that address, and they’ll email you back with a link to it. Click it, go in, set up the name and URL for the blog, and start emailing more stuff to it. I’ll write more, probably on solobasssteve.com, about the kind of sharing that posterous makes possible for live events. But for now, you’d need to give me a seriously good reason for not setting an account up to start sharing cool things for me to not think you just don’t care about ‘music online’. How do you post stuff to Posterous? Well, if it’s youtube, just send the URL (not the embed code), via email, with a few words about it, and it’ll cleverly be embedded in the blog. Srsly. For BandCamp, just click on share, grab the embed code (the one for ‘wordpress.org’ works great), copy it into an email, write a few words recommending whatever it is you’re embedding and send it. Then, post a link to the Posterous URL to Twitter/Facebook/email/whatever, and away you go. 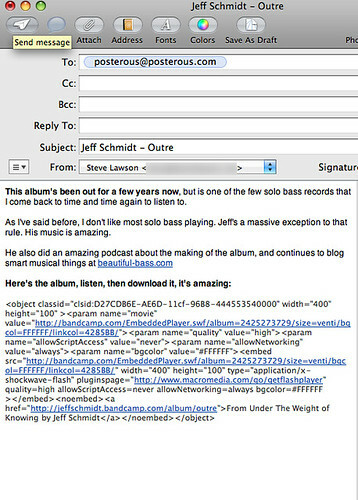 That’s a screengrab of an email sent to posterous, that created this post. Sow some Karma, start a blog. 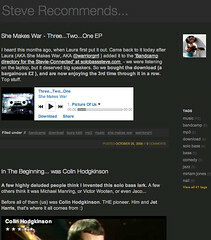 Oh, and if you want some starter material, have a look at the SoloBassSteve.com post ‘Bandcamp directory for the Stevie-Connected’, or indeed to my Posterous account. There’s loads of fantastic stuff there. Here’s a few cool Posterous accounts to check out: Andrew Dubber, Neil Alexander, Hannah Nicklin, Linda Palmer. Is there a feature on Posterous that compels people to cut and past entire articles from other people’s blogs? As always-entertaining and informative-even though I barley keep up with what I’ve got going already I think starting a Posterous Blog would actually help matters! It seems like a great way to throw up those ‘quickie’ blogs and leave more time to develop the more detailed ones without feeling backlogged-I’ll keep you posted! Wish I’d have known about this before starting the one on blogspot. Seems very efficient. I could use more efficiency! I started using Posterous since I read Andrew Dubber’s great post about using it to create a web presence for a band that had none. It is a great tool to keep someone blogging as it somehow feels less “formal” than when I post to my main blog. When you link it to your other social sites it becomes even more convenient and powerful. What I don’t get is why friends of mine who have other blogs have started using posterous, too! It is as if suddenly it is the place to be. You convinced me Steve, I didn’t get it until I read your post here. The virtue of quickly blogging great content you find and the ease of set-up and updates make this a winner. Amazing how you can just attach photos or mp3s in an email and the turn neatly in the blog. Thanks for the excellent advice both of you.